After having our first son, Cole, in 2007, Daron and I knew that we wanted more children. We were ecstatic to learn that we were expecting again in February of 2009. We soon found out that we would be blessed with another little boy who we decided to name Owen. On October 21, Owen made a grand entrance at 37 weeks and five days. He was seven pounds, four ounces, and 20 inches long. At first we were congratulated on a very happy, healthy baby boy. However, within a few hours, it became clear that Owen was having problems breathing. 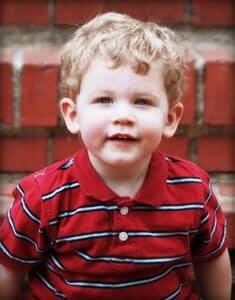 By the next day, he was flown to Levin Childrens Hospital in Charlotte, North Carolina, for extra help. Despite their best efforts, Owen was not showing improvement. Owens lungs became worse as the days passed, and the doctors felt that he may be fighting a virus. Five days later we came in to find his bed surrounded by doctors and nurses. He had gone into complete heart failure and was not expected to make it through the night. Later, we would learn that his diagnosis was Enteroviral Myocarditis. Since that day, Owen has overcome extraordinary circumstances and has proven to be a very special little man. Regardless of what the books say, Owen is still with us and has gifted our family with days of laughter and wonderful smiles. He reminds us that life is precious. We are so thankful to God for the gift of our little Owen. This experience has taught us much about having faith, trusting God, and the true power of prayer. Owen definitely has a long road ahead, but we remain hopeful and know that God will continue to lead us through this journey. What an inspiring story! It’s always refreshing to hear about miracles.